Vanilla Extracts | Spices Etc. Madagascar Vanilla Beans are essential in cook's and baker's kitchens all around the world. The island of Madagascar is known for its Vanilla Beans because of its perfect climate to grow the finest vanilla beans in the world. Madgascar Island was originally the Bourbon Islands which is why the Beans are commonly referred to as Bourbon Vanilla Beans. 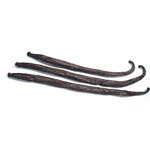 Each Vanilla bean is approxiamtely 6-7" in length and contain about 1 TBSP of vanilla extract. For use in homemade vanilla extract, ice cream and vanilla sugar, Madagascar Vanilla Beans are pure heaven! 100% PURE Mexican Vanilla Extract is the real deal. Vanilla Beans are grown all over the world, but originally came from areas in Mexico and Guatemala, thus making the Mexican Vanilla beans long in tradition and flavor. 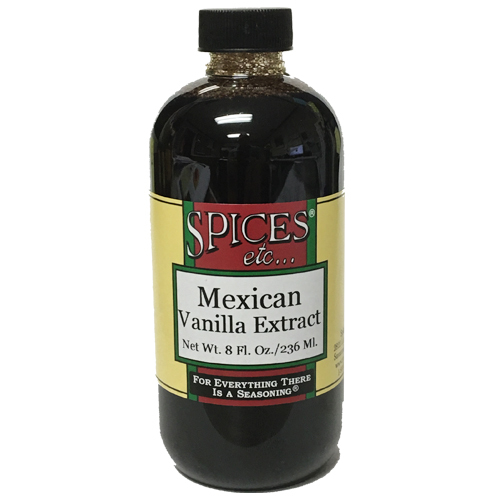 Mexican Vanilla Beans can be used in any recipe calling for Vanilla Extract, but it is especially good in making cakes, biscotti and frosting. It has a sweet and woody spice flavor and is the perfect ingredient for whipped creams with a nice vanilla overtone. Remember, one tablespoon of vanilla extract is equivalent to one vanilla bean, so it is easy to substitute for OUTSTANDING Vanilla flavor that may call for Vanilla Beans. Enjoy the flavor of Mexican Vanilla Extract. Ingredients: Mexican vanilla bean extractives, alcohol (33%). Single & Double Fold Vanilla 8 Ounce Set. Year after year, Spices Etc. best selling products are our Single-Fold and Double-Fold Vanilla extracts. Now, you can enjoy the UNREAL flavor of both of these for a reduced price. You can save $$$ when you order both of these outstanding extracts! They are perfect for baking and cooking new recipes or your favorite family recipes! Vanilla is one of our customers favorites! 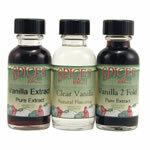 We have created a sampling of vanilla for you to enjoy......and save! The assortment comes with a 2 oz. bottle of Single Fold, Double Fold & Clear Vanilla. Baking was never so easy! Vanilla Extract, this Single Fold 100% Madagascar Bourbon vanilla beans Vanilla Extract, the standard for quality vanillas, are used to make these high grade extracts. Pure Vanilla Extract is a great way to add vanilla flavor to baked goods, as well as cakes, cookies, icings. Vanilla Extract has a creamy flavor that not only can be used with baking, but added to barbeque sauces or salad dressings for a sweet, velvety flavor. 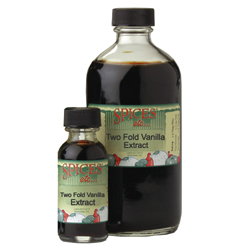 Two Fold Vanilla Extract is made with 100% Madagascar Bourbon vanilla beans and it contains twice the concentration of vanilla bean's extract when compared to a single fold vanilla extract, thus it is twice as strong. Two Fold Vanilla Extract has been a secret ingredient for bakers for years with creating a more distinct and powerful vanilla flavor in desserts. 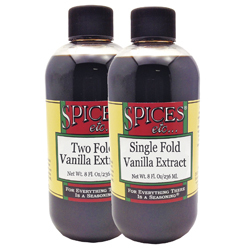 So, when using this extract in your desserts, use about the same, or a little less, as called for when using the Single Fold Vanilla and your baked goods will come to life with that delicious Vanilla Flavor! Non-flavor ingredients include water, alcohol (38.5%), propylene glycol. 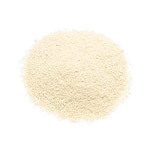 Vanilla powder is made by spraying high strength extract onto a malto-dextrin base. the base is then dried and powdered, preserving the vanilla flavor in dry form. Use vanilla powder in place of vanilla extract for recipes that should have no color. It is a good alternative to clear extract, which has much of its flavor filtered out. It is also popular used to flavor coffee or as a sprinkle on French toast. Non-flavor ingredients: dextrose, silicon dioxide.